Where were the bride and groom while the guests were waiting under the tent? 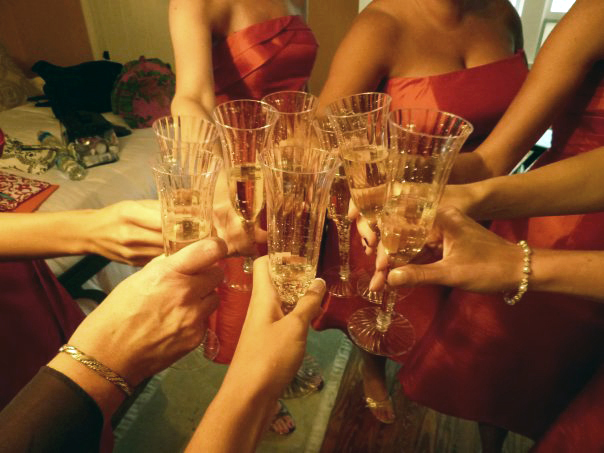 Well, after I got some formal photos taken with my bridesmaids and parents, we returned indoors. And, as soon as we were safely under rooftop, the raindrops began to fall. With less than an hour to go until the start of the ceremony, the girls did everything they could to keep my mind off the weather. This included blocking my view of the windows and pouring me a glass of champagne. While we were indoors toasting, the boys were outdoors gathering paper towels to dry the chairs. 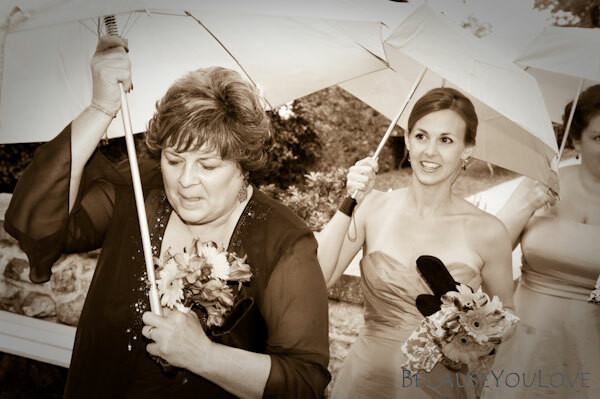 I later learned that Coordinator Betsy had approached Nick to tell him that they were moving the ceremony under the tent. Nick said, “Oh, Emily is not going to be happy about that.” And he admitted that he wasn’t all too happy either. He asked Betsy if they could postpone the start time in hopes that we’d have a window of dry weather. Thank you, Nick! And thank you, Betsy, for obliging. Also, Betsy refused to let Nick and the groomsmen dry the chairs. Enter the farm crew. They emerged from the fields in pick up trucks. I’m not kidding. I got the report later from several groomsmen and guests. Of course, all of this was unbeknownst to me at the time. We made our way from the stone house to our cars in accordance with the schedule. 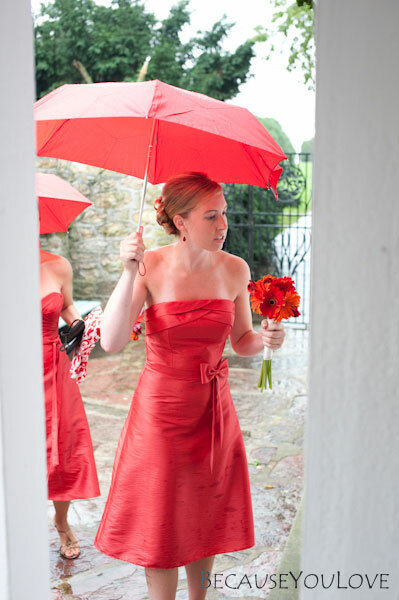 Dad held the big red umbrella over me as I hoisted myself and my dress into the car. And then I looked down and saw blood on my dress! Yes, blood. Apparently, I had cut my toe just below the nail, and the blood managed to make its way onto my ivory gown. Bridesmaid Kristen to the resuce! She emerged from her car with the emergency kit and helped me to clean my dress with a wet wipe and put a bandaid on my big toe. Our caravan of cars then drove up the road to the VIP parking spots outside of the entrance to the Sunken Garden. We had been instructed by Betsy the previous day to wait until the golf cart arrived to pick us up. When the golf cart did arrive, he pulled up to Dad’s car window. He said Betsy was moving guests under the tent. And I said, “No, can we please wait until the rain stops and move them back into the garden?” (See, Nick and I were definitely reading each other’s minds.) He sped off and returned a few minutes to later to say that’s what they would do. And so we waited. Me, Dad, and Laura in one car. Mom and a few bridesmaids in another car. And a third car with the remaining girls. 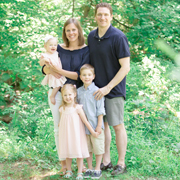 After about 15 minutes of sitting and waiting (not to mention Laura scanning the radio for upbeat songs and Dad saying, “We better start soon; who knows when it’s going to let loose again”), the golf cart returned to take Mom and the first group of girls. Then the second, including Laura. And, finally, it was time for the bride the and father of the bride. We rode along the bumpy, muddy path to the stairs to the pool house. By the time we arrived, the guys and gals were lining up. 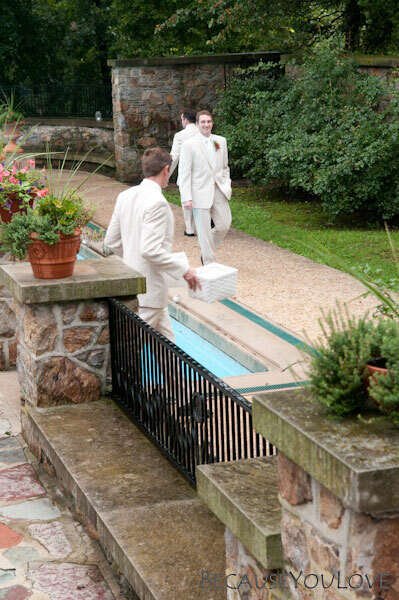 Once Nick and the groomsmen were out of sight, it was safe for us to step into the pool house. I gave a little wave to Ring Bearer Sean, and he gave me a huge smile in return. 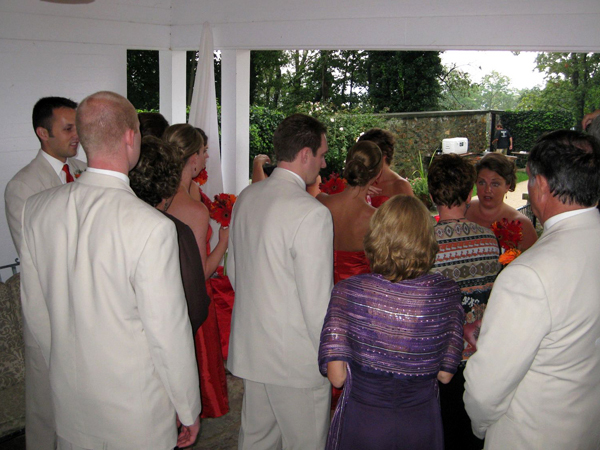 Slowly, the bridesmaids made their way down the stairs and into the garden. Dad and I stepped up, just behind the stone column of the gate and out of view of the groom and guests. And we waited for our cue. I was damp from the rain, but giddy with excitement.